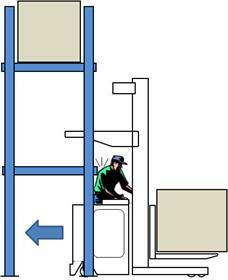 An innovative safety device to protect operators of stand up industrial trucks against accidental rear-ward collisions with racking systems. 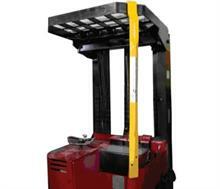 Standup forklift underride can occur when a horizontal rack beam can penetrate the operator compartment. If there are no pallets or stock on the floor, and no bumpers at the height of the overhead guard, the forklift is free to keep backing up, crushing the operator between the rack beam and the front of the compartment. You can see an illustration of an underride accident in the video below. In a 2008 report, the American Society of Mechanical Engineers (ASME) stated that "greater than 50% of . . . 3,000 accidents studied involved a collision between a stand-up forklift and a stationary object, resulting in . . . 700 serious injuries and 22 deaths . . . of operators." But often, these actions are impractical. 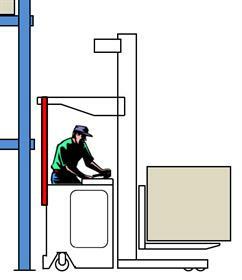 The authors of the ASME report concluded that additional forklift guarding, such as rear vertical posts extending from the forklift body to the overhead guard, will prevent injuries associated with horizontal intrusion collisions. Lakeport Metalcraft Inc. has been manufacturing The Backbone® Safety Bar for Reach Trucks & Standup Counterbalance Trucks since 2011. The BackboneÂ® is fully compliant with the ANSI B56.1 Standards, offering protection against collisions up to 1.6 km/h.